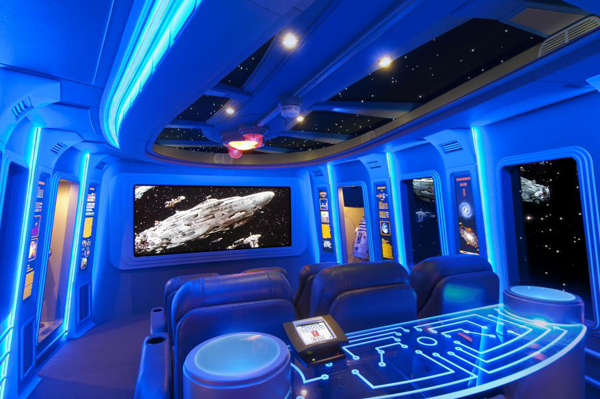 If your abiding love for the Star Wars franchise extends to collecting figurines but not to custom-building your own themed rooms quite yet, these projects might just kick you into that higher echelon of fandom. 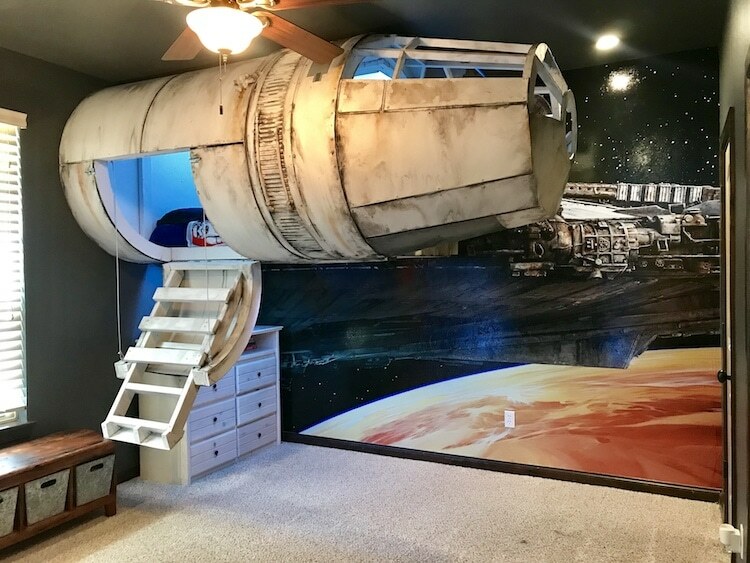 From parents who have built Millennium Falcon cockpit pods as beds for their kids to entire family homes filled with references to the series, these Star Wars-themed rooms and interiors definitely take it to another level. 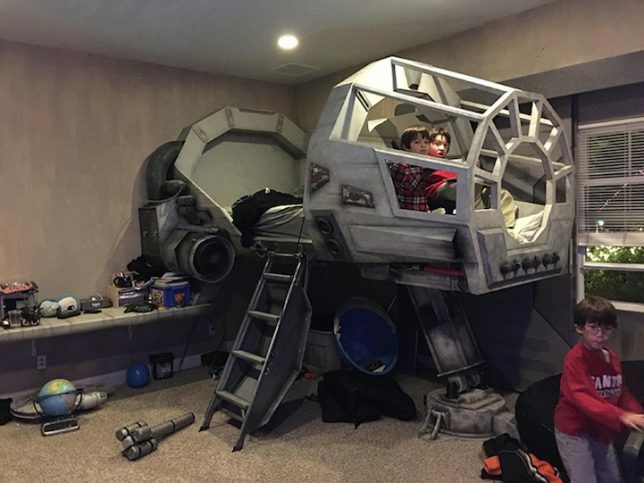 When Redditor Dericrw’s son refused to sleep in his own bed, insisting on creeping into mom and dad’s room night after night, he decided to tempt him with something too cool to pass up: a custom-made Star Wars bedroom featuring an elevated sleeping pod modeled on the Millennium Falcon. 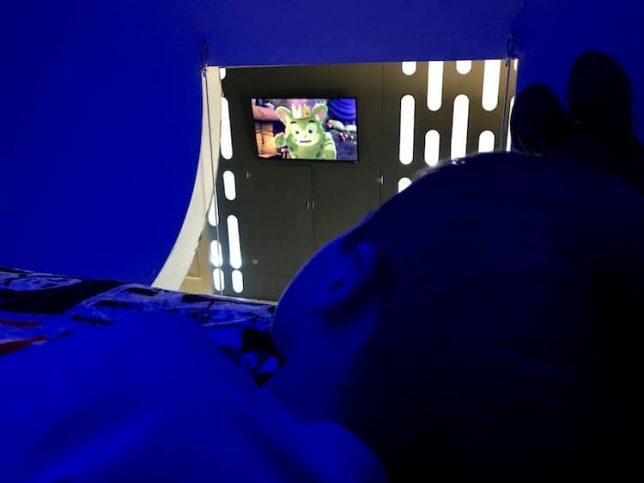 The pod is ten feet long, four feet tall and five feet wide, tricked out with color-changing lights, a fan and a bedside bookshelf. 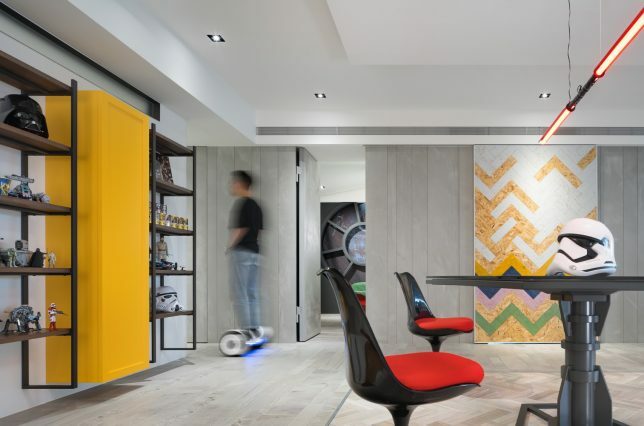 A vinyl mural fixed to the rear wall looks out into space, while the opposite wall features a custom grille to complete the effect. 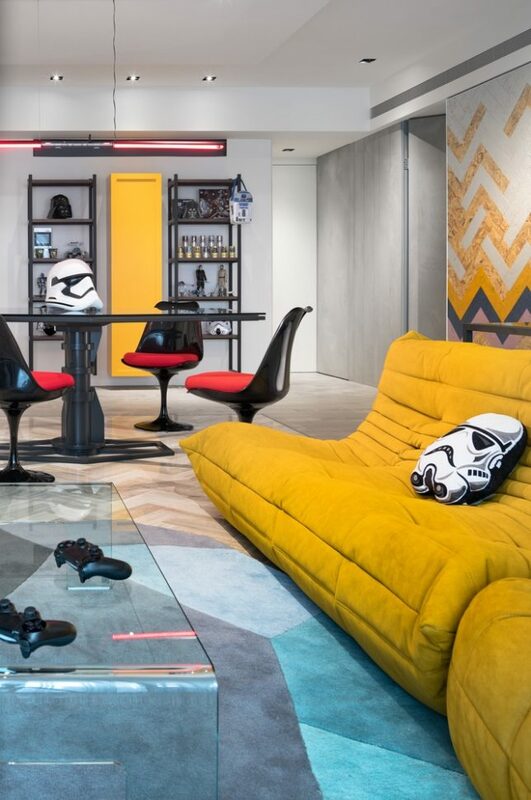 A family in Taipei, Taiwan gets a modern residence interspersed with Star Wars-inspired elements in this fun project by White Interior Design. 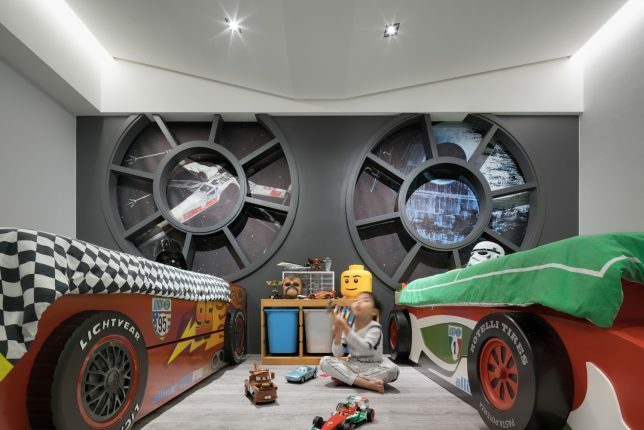 The kid’s room is based on the Millennium Falcon driver cabin. 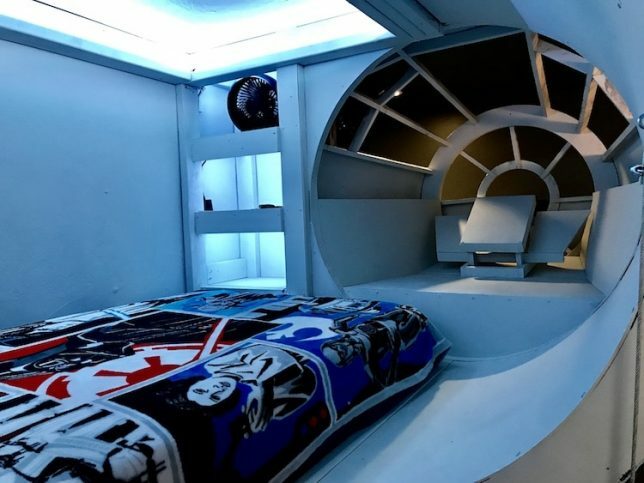 Designer Edward McGowan collaborated with his brother Peter, an architect and interior designer, to custom-build a Millennium Falcon bed for his son. Peter explains on Reddit that the renovation makes use of found items and donated time for a final cost of only $250. 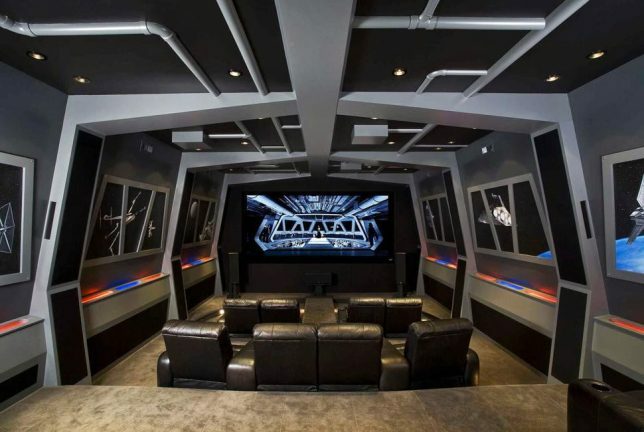 For this ‘man cave’ in Honolulu, Modern Home Systems was asked to fulfill the client’s dream of having a designated theater in his home with a design straight out of Star Wars. 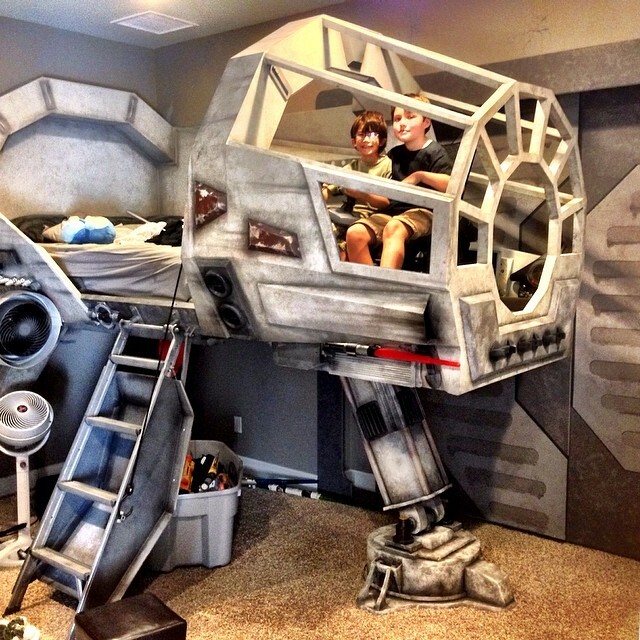 They definitely delivered, complete with a life size R2D2. 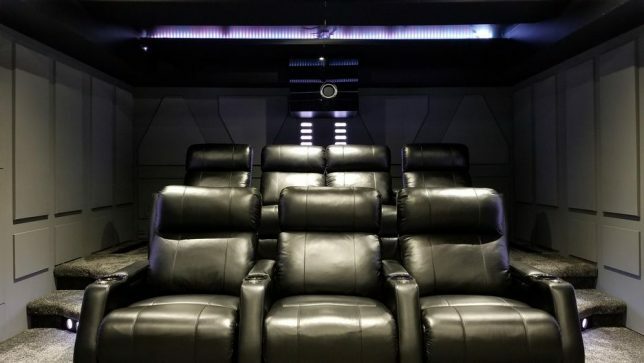 The listing doesn’t appear to be active anymore, but this home theater is part of a vacation rental in Kissimmee, Florida capable of hosting 24 overnight guests. 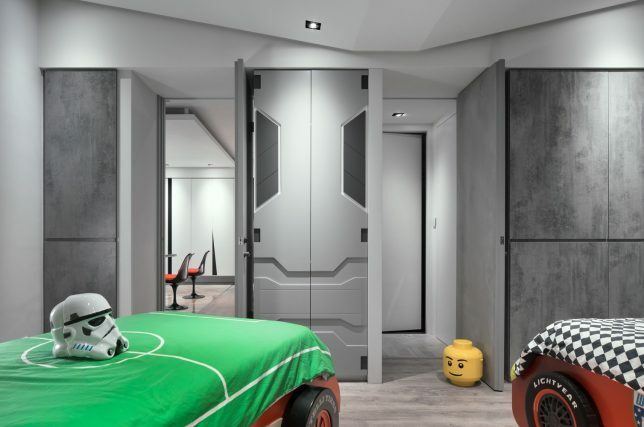 Other themed rooms in the house include Toy Story and Despicable Me bedrooms. 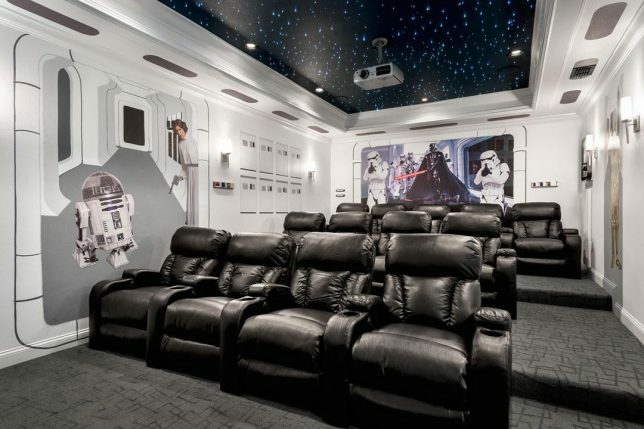 Two married computer programmers commissioned Orren Pickell Designers & Builders to create this ‘Star Destroyer’ theater for their home in Libertyville, Illinois. 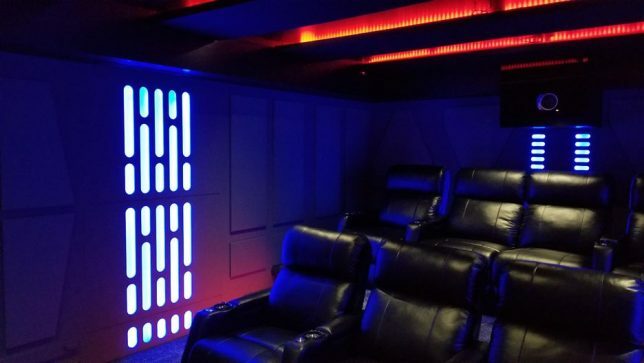 Patrick and Stephanie of Nixa, Missouri worked with Shawn Byrne of Quest Acoustical Interiors to incorporate a Star Wars-themed home theater into their new home. 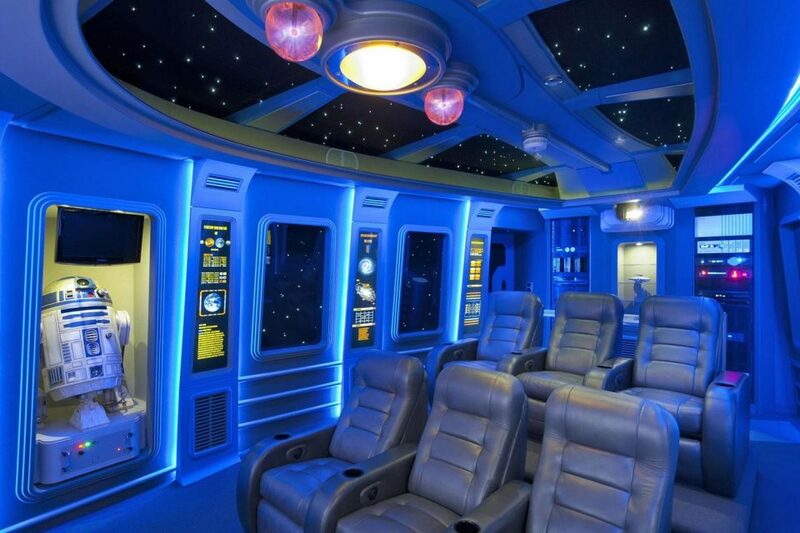 Most of it is made of MDF and frosted plexiglass.